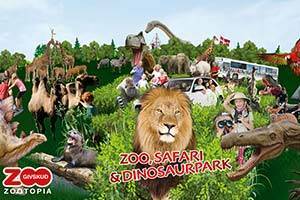 Go on a fantastic safari in GIVSKUD ZOO. Come close to lions, giraffes and rhinos. And take a wild walk 150 million years back in time and meet the giant dinosaurs. Look forward to a tremendous day in the world of the animals, where the whole family will have great experience and time together. 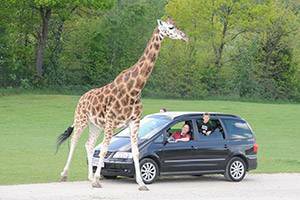 Go on the classic safari in your own car and meet animals from Africa as well as North and South America. Stop for the zebras and notice the many species of antelopes. Naturally the safari ends by the lions. 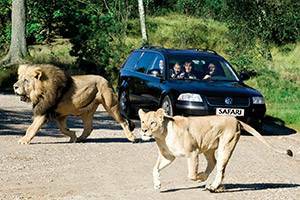 Feel the thrill when the big cats sneak around your car - if you dare? You can also go on safari on foot and greet the male gorilla Kipenzi and his flock. Or see animals like wolves and elephants get fed. Remember to visit the large tropical house with the new predators of the park; the South American giant otters that swim around in their pool and get fed as you watch. The children can even help the zoo guide feed the camels. Read more on www.givskudzoo.dk, which also informs about newborn pups among the app. 60 animal species in GIVSKUD ZOO. 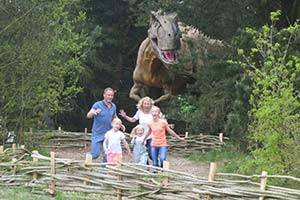 Stay close together during your walk around the new dinosaur park. Don’t be scared when the Tyrannosaurus Rex turns its head and roars or when the Dilophosaurus hisses. All 17 dinosaur species are in natural full size - also the 40 metres long Argentinosaurus, which is the biggest in the world. Finish the day with relaxation on the playground, where the children can go wild. 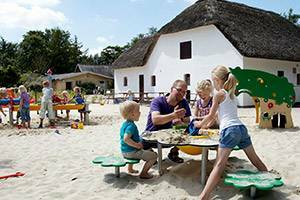 Or try some of the many other activities for children; during the weekends and high season you can ride on the safari train, wash gold and bake bread twist in the tepee camp. You can also cast a dinosaur tooth or go on a fossil hunt in the dinosaur park.